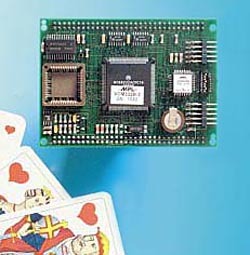 The VCM332 is one of the most powerful single board computers, in relation to its physical size, available on the market today. Built around the popular MC68332 microprocessor from Motorola and operating up to 25.166 MHz, this module contains a maximum of 1Mbyte of battery backed SRAM, 1Mbyte of EPROM, 1Kbit serial EEPROM, three serial ports, one 16 bit timer and a Real Time Clock. Board dimensions are kept to a minimum which results in a size of just 95x69mm. The board is configurable with of dip switches and contains connectors for debugger and serial interfaces. Connection to the board is made through two 64-pin connectors. Almost all signals of the 68332 and peripherals are available on these connectors. The use of 100% CMOS technology results in an exceptionally low power consumption of just 140mA at 5V (with 256K byte SRAM, 128K byte EPROM on-board operating at 16.78MHz). With its compact design and low price the VCM332B is an ideal solution for many industrial applications requiring high performance processing power in a small cost effective package. Configuration dip switch for chip selects, interrupt etc.